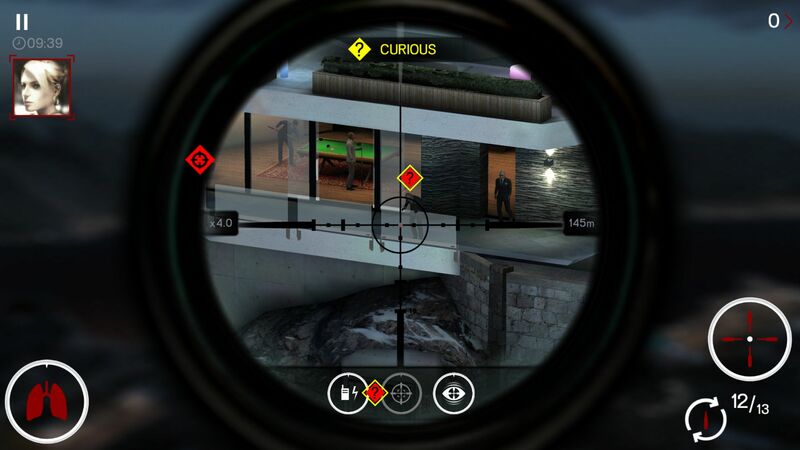 I am extremely conflicted about Hitman: Sniper ($0.99). It’s a great game, a legitimately fantastic mobile title. It’s a game that takes a simple premise of sniping and turns it into a complex puzzle game, where you have to learn how your weapons and abilities work to piece together sequences of actions to get the most points possible, through becoming really good at the game. Seriously, Square Enix Montreal has made an absurdly clever game. It may be more ‘traditional’ than their previous Hitman Go ($4.99) was, but it shows the same sparks of clever creativity that made that game special. I just wish that there was more than one level to play over and over again! 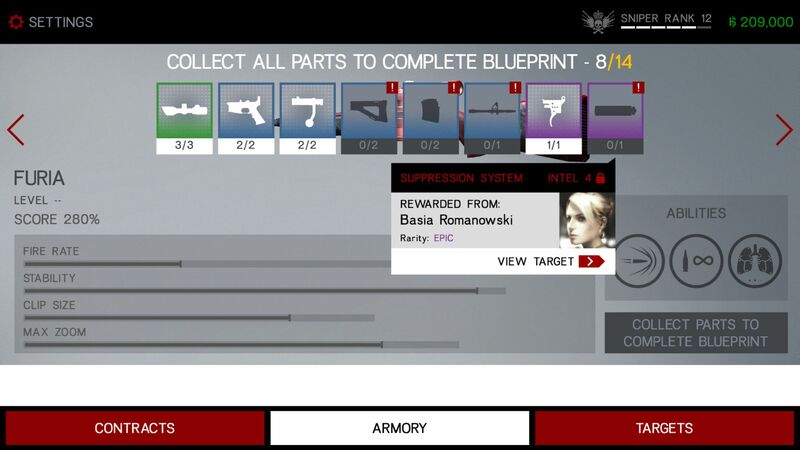 See, I kind of understand why Hitman: Sniper has one level. It’s one big, intricate scenario. You’re Agent 47, and you’re staking out a house party, completing a mission where you have to take out a particular target. There’s a total of ten high-value targets, guards, and the occasion civilians, and your missions usually involve killing one of those targets, along with a secondary objective. Say, for example, disposing of two bodies while being extracted, as you have ten seconds after the key target is dead to get out of Dodge. The missions get more and more complex, but the game does a great job through the missions of teaching you how the game works: you’ll learn how to execute a domino kill, which is worth a lot of points. And that’s the thing with having one big scenario: you have to learn it. I can learn the ins and outs, knowing which spots are ideal at certain times. I know early on you get one quick shot at the elusive Tuulia Hernandez, if you want. There’s a guard that can be shot right off of a ledge without anyone noticing. I know when I can get an explosive double-kill not long in. Everyone moves in predictable ways, but is affected by the actions you undertake. And as you play more and more, you start to figure out just how everything works. And it’s an amazing feeling when just by instinct, you go from one shot to another, confident that you know what will happen. Constant repetition teaches you how the game works, and the new missions keep challenging you to hone your skills and try new things. Soon, a mission like getting a double headshot will be no big deal because you know when exactly that will happen. The scenario is also kind of cool because there’s a story there that you’re not getting. There’s the two lovers who wind up dancing in the dark. That’s not a euphemism, that’s what they’re doing. Why are those three targets talking to one another? Who is that rogue agent? Why is Tuulia Hernandez trying to snipe that one guy? You get only the faintest details once in the narration, otherwise you’re observing from a distance…and shooting them in the head. To be fair, they’re all the biggest idiots ever. Some dude just fell on top of another one after a loud gunshot, and you want to go back to partying because hey, see no evil? You’re morally-empty cretins. Except for you, dude on the toilet who had nothing to do with all this. I only killed you because I got points for it. You may feel like a bit of a psychopath while playing this game. But then you find the easter eggs on the map and feel better. 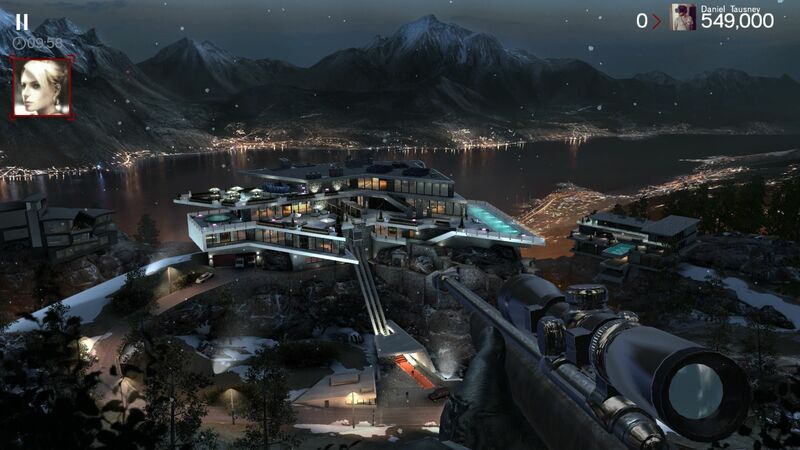 It’s seriously a dense and complex scenario, and Hitman: Sniper gets the most possible out of it. But here’s the problem: this game is really repetitive because the one scenario presented is all you get. To be fair, I kind of get it, and I can lose a lot of time to this game. But I can’t help but feel like if there was just a bit more variety, if I had other ways to test my skills, I’d like this game a lot more. The one level gets a bit old after a while, and making a man fall on another man shouldn’t feel rote. But yet it does. I imagine creating another scenario to play would be tough, and again, the one you get is dense. But I can’t help but feel like Hitman: Sniper could have been more. This is a game that feels a lot better on iPad than on iPhone. You get to see more detail and aiming is a bit easier with the larger screen space. Even just going from the iPhone 6 Plus to the iPad Mini 2, there’s a noticeable difference. The experience is so much better on the iPad. The game does boast cloud-based saves if you log in with Facebook, and they work perfectly. Having a game seamlessly sync progress between devices is downright miraculous in an age where iCloud is riddled with problems. Game Center causes my device to crash after I got past chapter 2, mission 2, but your mileage may vary. If it is crashing on the launch version, then perhaps sign out of Game Center until an update that fixes the game comes out. As you progress to new missions, you earn money and can upgrade your collection of rifles. Hitman: Sniper was once going to be free-to-play, but I’m glad it went premium. You get enough money to never feel like you’re falling behind in upgrades. The roulette to get more weapon parts actually winds up being something I fell behind, where I had better rifles from ranking up than what I got in the roulette, but I was reliably getting new pieces over time. I’m just that good. I do wish the score bonus was an overall bonus and not tied to a specific weapon, as each rifle has its own special powers and characteristics. If I want to get the most possible points with the rifle with explosive bullets, why can’t I? It just feels limiting. And the game’s leaderboards feel like it’s just who’s played the most, rather than just the best, as someone with a better rifle can get a higher score than someone with an earlier one just with a smaller points bonus. You can buy some rifles as you play with in-app purchases, which feel like a relic of this game’s free-to-play past. Still, they’re not necessary, though if you get to a point where you want to drop $9.99 on one of the most powerful rifles so you can get up to the Platinum and Assassin tiers, well, be my guest. Otherwise, there’s a fine progression. Hitman: Sniper is a game that has five-star potential: it’s just that brilliant. It’s a smart, clever, and even darkly funny game that works incredibly well. But that one level…it shouldn’t bother me as much as it does, because the one level is great, but I can’t help but think, what if there was more to do? What if I could rediscover the thrills of figuring out how a level works in a brand new scenario? I want to believe there’s more you could do with Hitman: Sniper‘s setup here. What it does is top-notch, but I don’t think it does enough. That’s what keeps it from being an absolute must-have: the lingering feeling that maybe this game hasn’t quite reached its full potential.